Mazda has changed the game plan with its second generation CX-7 all-wheel-drive Crossover model. 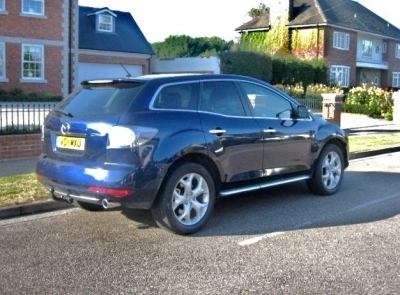 About three years ago I tested the original CX-7 powered by an awesome 265 bhp 2.2-litre turbo petrol engine that combined high performance with practicality but at the cost of getting only about 280 miles from its 69-litre (15.17 gallon) fuel tank. Since then the world has changed drastically, and so has the Mazda CX-7, the former for the worse, the latter for the better I would emphasise. Of course, the petrol powered CX-7 may have garnered a good return for Mazda on the American market and for a vehicle that is a blend of competent all-terrain abilities allied to near MPV interior space and obvious lifestyle attractions. The dominant but rather thirsty high performance character clearly limited the sales potential in the UK and Europe where diesel power is generally considered essential for a car maker to prosper in what is a rapidly expanding market sector. Admittedly, on the UK and European version of the original CX-7, the fully independent suspension system had probably been more finely honed, not only to cope with the abundant performance but also to suit European roads and to attract buyers who remained discerning even when changing to this type of vehicle. It is no secret that Mazda has been carrying out some extensive engine developments, the early evidence of this is the change to a highly efficient turbocharged 2.2-litre 4-cylinder diesel engine for the CX-7 which is the forerunner to a number exciting new power units for employment in other Mazda models in the none too distant future. Watch this space! Developing 171 bhp with enormous flexibility, and well above average refinement, this state of the art Mazda diesel is complemented by a reasonably clean changing 6-speed manual gearbox that provides nicely spaced ratios including an ‘overdrive’ top gear to generate very respectable performance – Mazda claim 0 to 62 mph (100 kph) from rest in11.3 seconds and a top speed of 124 mph. A combined fuel consumption figure of 37.7 mpg is obviously sensible especially as it the is a full 10 mpg better than the original petrol version. Put bluntly the 69 litre fuel tank’s range has soared from around 380 miles to about 520 miles. Yes, this is a real driver’s car, plenty of gusto when requested, a positive ride, good feeling electro powered steering, a very comfortable driving position provided by a well upholstered (leather, of course) seat with power adjustment, vision as good as you get with this type of body and augmented by a wide angle rear view camera plus, as I would expect from a highly effective all-wheel drive transmission system, near class leading ride and road holding qualities. A lot of effort has gone into improving safety, this vehicle already having an immensely effective braking system based on four ventilated discs and to add to the existing multi air bag system comes such items as an Emergency Rear Stop System (ERS) that automatically activates the hazard warning lights under hard/abrupt braking. A REAR Vehicle Monitoring system, already in place on some other Mazda models, employs radar to cover blind spot driving situations. Suffice to say all the usual electronic stability and braking aids are standard. For this latest CR-7 version Mazda has not messed about with the basic qualities, though there has been some cosmetic improvements, a bit more chrome detailing. I suspect an upgrade in some trim materials, certainly a bit more equipment (there is only this high specification Sport Tec version on offer and with only a very few extra cost options). In my opinion, this adds up to a premium class product. In essence Mazda’s latest CX-7 could be described as a niche model in its market sector. Consider all these aspects: an immensely comfortable 5-seater with acceptable luggage capacity, executive class equipment, high safety standards, good on the eye looks, a performance character that will please the owner’s pocket as well as provide easy yet entertaining experience and a level of refinement better than a number of very upmarket saloons. I noted that it did not have roof rails, frankly I think they would spoil the lines of what I think is probably the best looking Crossover I have spent time with. If a Crossover vehicle is being considered, if the price is in the budget then I suggest the Mazda CX-7 could be a revelation. Rivals include: Peugeot 3008, Honda CRV, Nissan Qashqai, Ford Kuga, Kia Sportage. BOOKS: Motoring orientated books for Christmas gifts? “Art of the Harley Davidson Motorcycle” photography by David Blattel with text by Dain Gingerelli £27.50. Surely a must for the diehard owners of these iconic machines but also a good tonic for a jaded lifestyle. Just leave it around the house and let your family and friends guess whether they will see you astride one and, of course, appropriately attired. For all motorbike fiends, whether they love a Harley, a Norton or a Honda this book doesn’t even have to be read, the pictures strongly argue the Harley’s case. Michelin Great Britain & Ireland 2012. For just under £15 this familiar red book gives thousands of reasons for breaking that journey or for starting a journey in the first place. A bit of browsing through nearly 1,000 pages could be that key to getting out and about. HONDA: A £40 winter check-up is being offered through Honda dealers. There is also a storage scheme for Honda owners buying winter tyres at £35 plus VAT for up to 12 months including two transfers if required. LEXUS: Early details have been reached of the new luxury class Lexus GS 250 saloon model due to launch alongside the new Lexus 450h in summer 2012. Power comes from a 206 bhp 2.5-litre engine driving through a 6-speed selectable automatic gearbox. SUBARU: The new Subaru XV Crossover model has achieved a 5-star Euro ECAP safety Rating. The car features an advanced impact energy relay system plus an extensive range of air bags. VOLKSWAGEN: An electric version of the Volkswagen Golf is planned to reach showrooms in 2013. A pre-production model has achieved a claimed range of 100 miles, touched 86 mph and reached 62 mph from rest in 11.8 seconds.